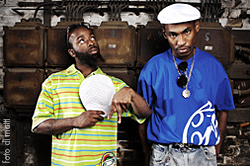 Hip-hop group the Ying Yang Twins, consisting of Kaine and D-Roc, will be the voices of a concert at the Rat this month. The Rathskeller Advisory Board and Hurricane Productions announced Sunday that the Ying Yang Twins will be performing at 10 p.m. on Feb. 20 at the Rat. Doors open at 9:30 p.m. and a Cane Card is required for entry. UM students are limited one guest that must be 18 or older and have an ID. No re-entry or large bags are permitted. There will be free giveaways for the first 100 people. Check back to themiamihurricane.com for updates on this story.